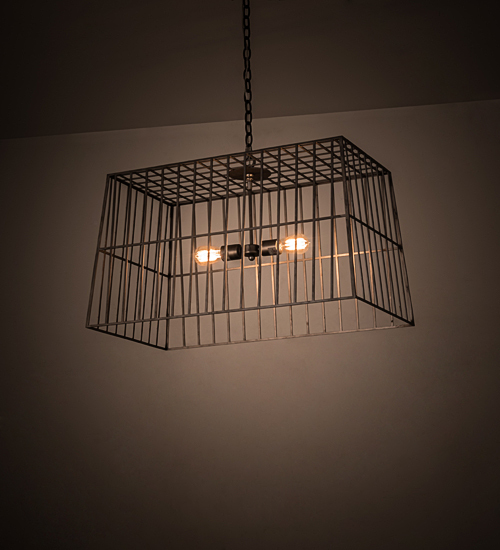 Description: Discover a unique tapered industrial design with this dramatic caged frame that reveals an exposed twin Edison styled lamp configuration displayed from within. The solid hardware and grill is featured in a Matte Clear Finish over Steel. The geometric shaped pendant is ideal for illuminating dining tables, conference tables and other residential and commercial spaces. Handcrafted by highly skilled artisans in the USA, this fixture is offered in a myriad of custom lamping options, as well as sizes, designs and finishes. The 32-inch long pendant is UL and cUL listed for damp and dry locations.